Astronomers are generally looking for larger and larger aperture telescopes in order to have a large collecting area and a higher angular resolution. It is not so much time that 8 m class telescopes are on duty and there are projects to build larger aperture telescopes like Extremely Large Telescopes (30 – 40 m). In this realm inhabited by such giants is still there need for small (≤ 2 m) telescopes? The answer is in the forefront observations and datasets obtained, for example, in a recent past by 2 µm All Sky Survey (two 1.3 m Telescopes) and Sloan Digital Sky Survey (a wide field telescope of 2.5 m). More recently, the gathering of new transiting worlds has been achieved with very small cameras. Small-telescope nets for variable star monitoring, asteroseismic campaigns and transient observations can produce a lot of good and important science. Last but not least several small telescopes have been proposed to fly on board of single satellite or satellite flotilla in order to enhance the knowledge in several fields of astrophysics. Kepler over all is an example, but future missions like e.g. CHEOPS, PLATO or ARIEL are planned to gather results on old and new extrasolar planets with their single or group of small telescopes. Most of these results are due to coupling small telescopes and improved detectors as well as H/W and S/W technologies allowing high performances in their duty. Moreover, small telescopes are daily used in didactic, outreach and training activities. 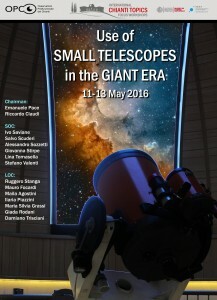 The CHIANTI TOPICS workshop put together experts in small telescope instrumentation and the user community in order to have an up to date view of results with this kind of instruments in the several fields of astrophysics and discussed its role in the giants era.